AGENT CARTER Season 1 Review | Warped Factor - Words in the Key of Geek. Matthew Kresal looks back on the first season of Agent Carter. For the better part of a decade now, the Marvel Cinematic Universe (MCU) has been an ever growing feature on the landscape of popular culture. What started out as a couple of “comic book movies” has become one of the most successful film franchises of all time and has been gradually expanded back into the comics that inspired it, and into the world of television as well. With a season and a half of Agents Of S.H.I.E.L.D. 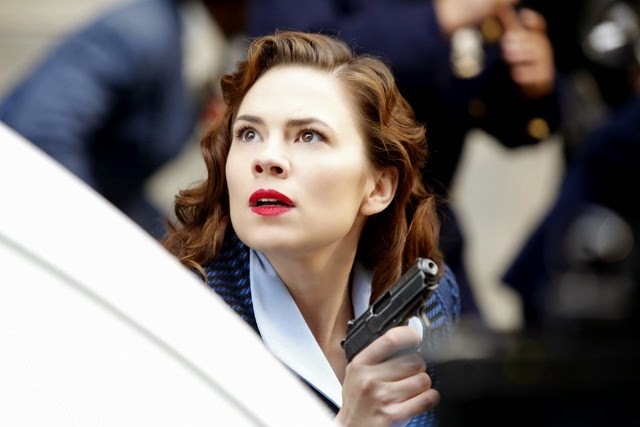 having aired, the MCU's latest televised venture takes viewers back to the 1940s with Agent Carter, an eight episode series set around Haley Atwell's character first introduced to audiences in 2011's Captain America: The First Avenger. 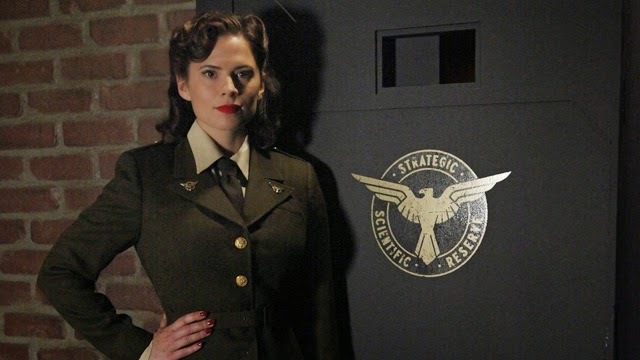 Atwell's Peggy Carter was one of the biggest highlights of First Avenger, a British agent working alongside the Strategic Scientific Reserve (SSR) in the fight against Hydra during the Second World War. Atwell described her character as “She can do everything Captain America can do, but backwards and in high heels,” and the film certainly proved that point as Carter took part in two of the biggest action sequences. Carter was also a voice of conscience for the transformed Steve Rogers, and a gradual bond and love interest formed between the two over the course of the film's events. Those events led to Rogers being frozen in the remains of a Hydra bomber in the Arctic, with Carter and the SSR thinking he was dead. Yet almost as soon as First Avenger was released, speculation was rife about the future of Peggy Carter. 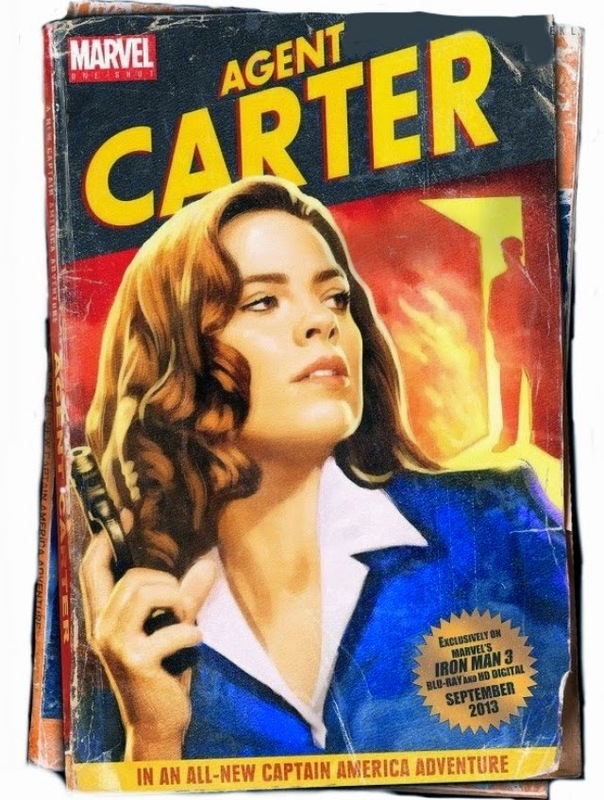 First came the Agent Carter Marvel One-Shot short film released on the Iron Man 3 Blu-Ray in 2013, this proved that there was potential for the character to be on her own. Following the character's appearance as an elderly woman in 2014's Captain America: The Winter Soldier, the bookends of her history were set but that still left a large portion of her life (and the MCU's history for that matter) unexplored. So it should have come as no surprise when, shortly after Winter Soldier's release, it was confirmed that an Agent Carter series was in development to air during Agents Of Shield mid-season break in early 2015. So, with the series having aired, just how successful has it been? Picking up on hints left in the character's post First Avenger appearances, the series opener "Now is Not the End" finds Carter a year on from the events of that film. Working for the post-war SSR in a significantly limited capacity, having been effectively reduced to a secretary, while also dealing with the loss of Captain America. However, events involving Howard Stark (Dominic Cooper) being accused of treason lead her back into the fray as she tries to clear Stark's name and find out who was really behind the selling (and, as we discover, theft) of Stark's inventions. Helped along the way by Stark's butler Edwin Jarvis (James D'arcy), Carter eventually comes to tangle with a mysterious organization called Leviathan, while also trying to stay one step ahead of the SSR's investigations of Stark and live her life outside of the SSR. Comparisons between Agent Carter and the first season of Agents Of S.H.I.E.L.D have been made elsewhere and I think they're fair to make. AoS came in for a lot of criticism during much of its first season for its many filler "villain of the week" episodes before the series finally tied into the larger MCU via the events of Winter Soldier. Agent Carter was successfully able to avoid this trap by virtue of its smaller episode count. 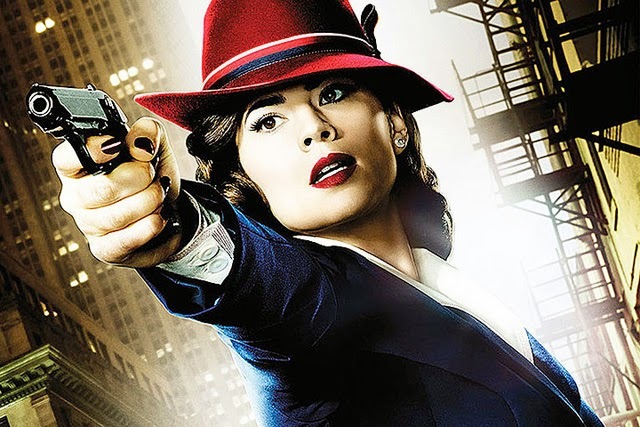 By doing only eight episodes instead of twenty plus, Agent Carter is more contained and has a definite beginning, middle and end which frees it of the standalone episodes that seem to have hurt Agents Of S.H.I.E.L.D in the early part of its first season. It also gives the chance for more character development in eight episodes than AoS (despite being a strong action/adventure series from the very beginning) managed in the same amount of time. Indeed, if the series did nothing else across its eight episode, it was certainly a showcase for Atwell. Right from the very first episode, Atwell and her character are off and running as the opener takes us from her apartment to SSR's New York City headquarters and across that city in the space of forty or so minutes. Atwell's earlier quote proves very true as the series goes along and Carter is forced by events to take a leading role that involves infiltrating factories, having fistfights on top of moving trucks, and leading troops in the field briefly in the fifth episode "The Iron Ceiling". Atwell excels at those action moments with an extended fight scene in episode six "A Sin to Err" being perhaps the biggest action highlight for the character. Of course, there is far more to both Carter and her performer than that. There's her interactions with D'arcy's Jarvis for example, which are a sheer delight to watch, especially in their comedic moments together which echo so many of the period's classic screen duos. More than that though, the series is arguably about Carter trying to find her place in a post-war world where opportunities for women were greatly diminished, as well as losing the great love of her life in the form of Steve Rogers. There are moments both in episode four "The Blitzkrieg Button" and the finale episode "Valediction" which drive that point home. It is in those moments perhaps, rather than in the action sequences, that Atwell and Carter are at their best. 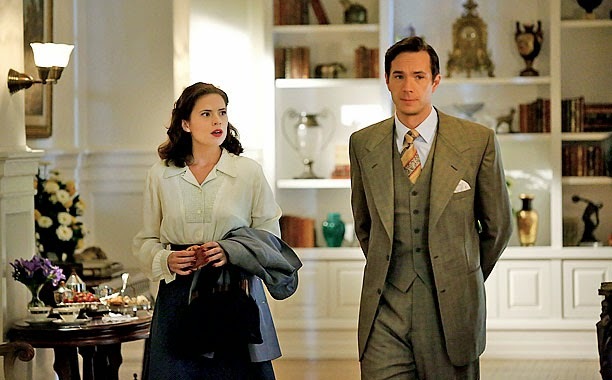 Speaking of D'arcy, his performance as Edwin Jarvis is one of the biggest highlights of the series. D'arcy gets to show off his rarely seen comedic talents in the role and, as mentioned above, his chemistry with Atwell's Carter is fantastic. D'arcy's Jarvis also works well as a fish out of water: a man used to serving rather than going into the fray as he does alongside Carter. Yet Jarvis develops across the eight episodes as he increasingly helps deal with dangerous situations as well as helping to fill in pieces of exposition here and there. Watching the platonic friendship between the two characters develop is one of the highlights of the series and something that helps it to standout from both Agents Of S.H.I.E.L.D and the larger part of the MCU. The series also features a number of call backs to the MCU as a whole. There's the aforementioned return of Howard Stark for example, as well as introducing us to the man who will inspire the Jarvis AI program we've seen associated with Tony Stark. Perhaps because of its setting inside the MCU, the series makes strong references to First Avenger throughout its run and ties back into characters and elements from it (including using clips of it in the opening minutes of the series). There's the return of Neal McDonough as Timothy "Dum Dum" Dugan and the Howling Commandos in episode five "The Iron Ceiling". Perhaps nowhere does the series use its First Avenger origins so strongly than in "Valediction" which neatly inverts one of the best moments of that film to make an impact upon viewers. The references aren't over done and are largely explained so that, if you happen to be one of the few people on the planet who hasn't seen a Marvel movie, you'll be fine. Agent Carter also deals with some larger portions of the MCU's back-story as well as incorporating elements drawn from the comics. About midway through the series we encounter a couple of new characters who both become increasingly important, filling in some of the background of one of the Avengers as well as elements seen in more recent MCU films. We are also introduced to the Soviet spy agency Leviathan as well as Captain America comic villain Johann Fennhoff (known in the comics as Doctor Faustus). Both are introduced in a way that, if like me, you're not a major comics reader you can still follow on and enjoy the ride. In that way, Agent Carter does what the MCU has been doing since Iron Man in 2008: telling great stories based on the comics without alienating everyone who doesn't read them.